University of the Balearic Islands, Palma (Mallorca). September 2017. 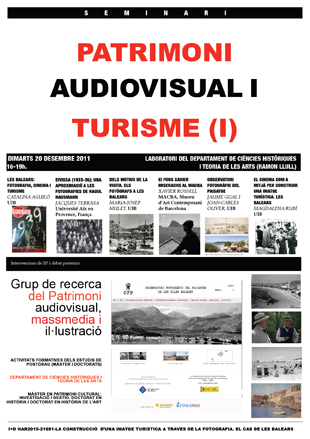 Lecture: Evolution of the tourist landscape: the city of Palma and the island of Mallorca. University of the Balearic Islands, Palma (Mallorca). 13 July 2016. Presentation: The Photographic Observatory of the Landscape of the Balearic Islands as an ICT resource for teaching. Authors of the presentation: Maria-Josep Mulet, Jaume Gual, Joan Carles Oliver, Cristina López-Polín, Maria Magdalena Rubí and María Sebastián. Speakers: Jaume Gual and María Sebastián. CITUR research group, University of Valencia. 14-15 November 2013. Maria-Josep Mulet: El turismo en promoción. La proyección icònica de las Baleares [Tourism in promotion. The iconic projection of the Balearics]. Author. Catalina Aguiló, María Sebastián: Visión fotográfica y cinematográfica de un espacio turístico. El Paseo Marítimo de Palma de Mallorca [Photographic and cinematographic vision of a tourist spot. The seafront promenade in Palma de Mallorca]. + info: : sessions diptych. Faculty of Tourism, University of the Balearic Islands, Palma (Mallorca). March 2013. Jaume Gual Carbonell. El projecte on line Observatori Fotogràfic del Paisatge de les Illes Balears [The on line project: Photographic Observatory of the Landscape of the Balearic Islands]. María Sebastián Sebastián. Fotografia comparativa i refotografia: el paisatge i l’arquitectura sota el prisma del turisme [Comparative photography and rephotography: landscape and architecture in the light of tourism]. Joan Carles Oliver Torelló. L’OFP i el marc internacional dels observatoris fotogràfics [The OFP and the international framework of photographic observatories]. Sorbonne University, Paris. February 2013. Paper: Turismo y viaje. Fotógrafos internacionales por las Islas Baleares [Tourism and travel. International photographers throughout the Balearic Islands]. IES Ca’n Peu Blanc, Sa Pobla (Mallorca). March 2012. Jaume Gual Carbonell. Què és l’Observatori Fotogràfic del Paisatge de les Illes Balears. Una història [What the Photographic Observatory of the Landscape of the Balearic Islands is. A history]. María Sebastián Sebastián. Fotografia comparativa: realització i utilització [Comparative photography: making and using]. Magda Rubí Sastre. El cinema: un mitjà per documentar el territori de les Illes Balears [Cinema: a means for documenting the Balearic territory]. University of the Balearic Islands, Palma (Mallorca). 17 January 2012. Jaume Gual Carbonell. Landscape Photographic Observatory of the Balearic Islands. Joan Carles Oliver. The Landscape Observatory Photographic in the International Frame. Magda Rubí Sastre. Documentation of the Balearic Territory through Cinema. University of the Balearic Islands, Palma (Mallorca). November 2011. Catalina Aguiló Ribas. Les Balears: fotografia, cinema i turisme [The Balearics: photography, cinema and tourism]. Jacques Terrassa. Eivissa. Una aproximació a les fotografies de Raoul Hausmann [Ibiza. An approach to the photographs of Raoul Hausmann]. Maria-Josep Mulet Gutiérrez. Dels motius de la visita. Els fotògrafs a Balears [On the reasons for visiting. Photographers in the Balearics]. Jaume Gual Carbonell and Joan Carles Oliver Torelló. Observatori fotogràfic del paisatge [Photographic Observatory of the Landscape]. Magda Rubí Sastre. El cinema com a mitjà per a construir una imatge turística. Les Balears [Cinema as a means for building a tourism image. The Balearics]. Àgora Bookshop, Palma (Mallorca). November 2011. L’observació fotogràfica del paisatge. Una eina per a l’estudi, la divulgació i la sensibilització [Photographic observation of the landscape. A tool for studying, disseminating, and raising awareness]. Eivissa. 7, 8, 9 and 10 April 2011. ParcBIT, Palma (Mallorca). 25 and 26 November, 2010. Presentation of the paper: Observatori Fotogràfic del Paisatge de les Illes Balears [Photographic Observatory of the Landscape of the Balearic Islands]. Congress and Exhibition Venue at Palma Airport (Terminal A). 13, 14, and 15 May, 2010. Department of Geography, History, and History of Art at the University of Girona and the Cinema Museum in Girona. 14-15 November, 2013. Presentation: Les filmacions realitzades a Mallorca entre 1898 i 1915. Les primeres imatges cinematogràfiques de l’Illa [Films made in Mallorca between 1898 and 1915. The first cinematographic images of the island].